This is a very easy appetizer recipe. All you need is phyllo dough, fresh figs, dried figs, goat cheese and a bit of sugar. 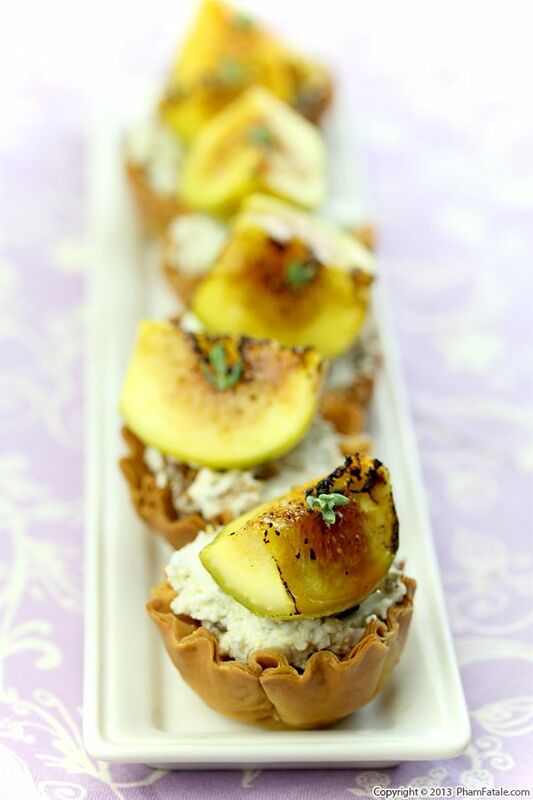 I "bruléed" the fresh figs to add another dimension of flavor and served them in the cute phyllo cups. It feels like the end of the summer already; figs are already peaking and I'm anxious to cook with what's ready to ripen on our trees. I'm so excited and I can't wait! “Tartine” is just a fancy word for an open-faced sandwich, using a single slice of bread with several ingredients on top. Growing up, my favorite was a tartine au Nutella, which as the name implies is a slice of bread slathered with the famous hazelnut chocolate spread. Tartines can of course be savory, and today’s recipe combines, some of my favorite and most decadent ingredients. 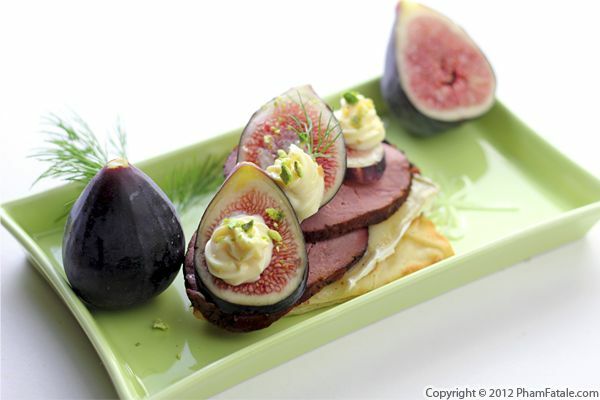 Fresh figs and red onions from our garden, sinful brie cheese, smoked duck, homemade mayonnaise and pistachios are all irresistible in their own right, and when layered together over a toasted naan, turn any meal into an unforgettable memory. This tartine hits every note; it's sweet, smoky and extraordinarily succulent. This may be too expensive to be worth serving at a large party. So if you plan to make these appetizers for a group, you might want to substitute another kind of meat in place of the smoked duck. We were lucky enough to be able to pick a lot of figs in our garden this year. We had so many, I made several kinds of fig preserves. 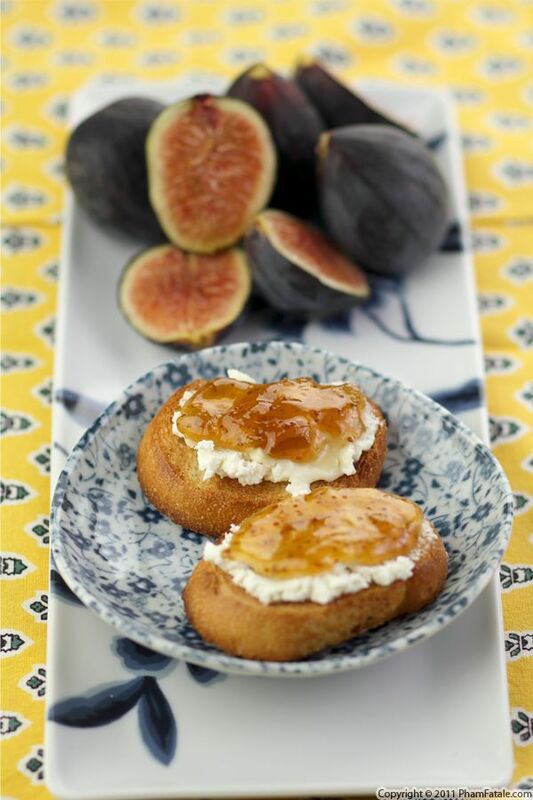 One of my favorite ways to use fig preserves is to pair it with goat cheese and it just so happened that I received delicious goat cheese from Cypress Grove Chevre today. I spread the two ingredients on crostini for a nice contrast of texture and flavor. I grilled day-old baguette and smeared a layer of goat cheese. The warmth from the bread let the goat cheese ooze and become creamier. The last layer was the fig preserves. I have to admit this easy appetizer is my favorite snack. I love them and could eat a ton! I have a little story that might sound silly to you but Cypress Grove Chevre goat cheese is very dear to my heart. I remember when I first got married, my husband Lulu surprised me and took me on the 17-mile drive in Carmel, which I had never seen before. I remember he prepared the most romantic picnic on the beach and fed me wonderful Cypress Grove chevre. I had never heard of the company before that picnic but the cute packaging and beautiful scenery has since made it unforgettable to me. The cheese is rich and creamy and absolutely captures what I love about French chevre. It is one of the few American-made cheeses I’ve had that rival its French counterparts. 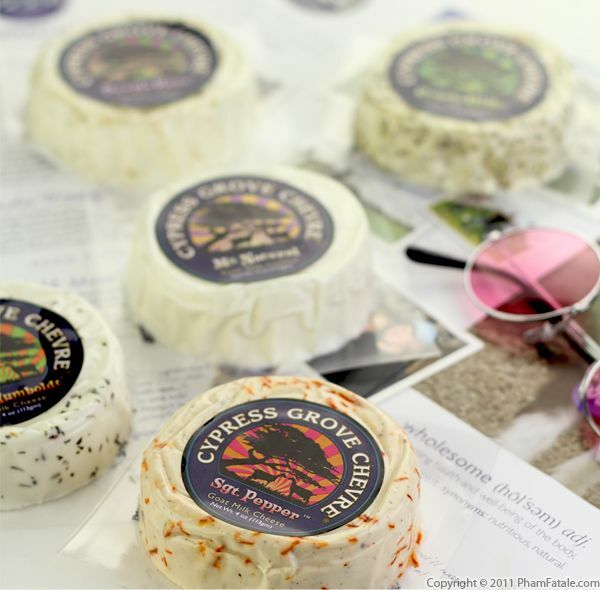 Cypress Grove Chevre will be a part of our December giveaways, so be sure to check back for your chance to win. Doesn't that sound awesome?